Although we don't really celebrate Halloween here in South Africa, I wanted to post a picture to go with the theme of the day. 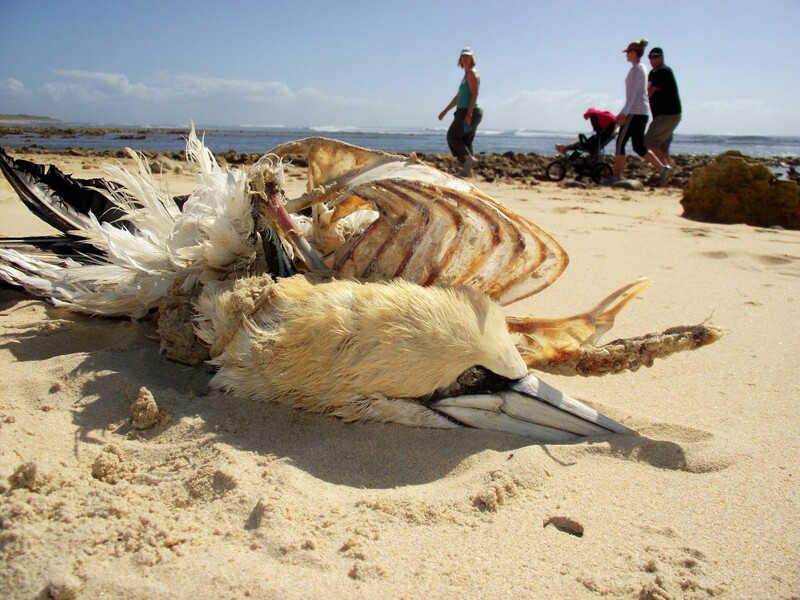 Unfortunately I haven't had a chance to go and take a Halloween photo, so decided on this picture of a dead gannet on the beach at Cape Recife. Originally I considered calling it "Zombie Bird" but then changed my mind to the title above, "Death on the beach". Judging by her love for animals, I have a feeling my daughter is going to be a vet on day. 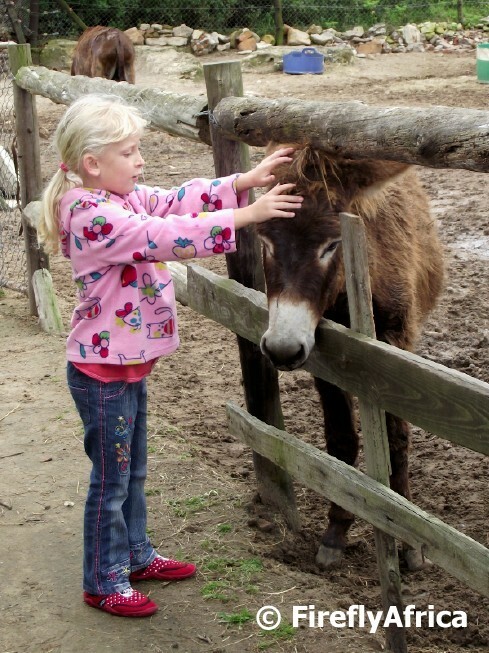 We visited the East Cape Horse Care Unit again the other day and Drama Princess got to go in with the baby donkeys. She just wanted to hug and hold them all the time. At home she's got a bird, hamsters, a dog, a box with silkworms and even a container with snails. Chaos Boy on the other hand would rather not touch any animal if he had a choice. 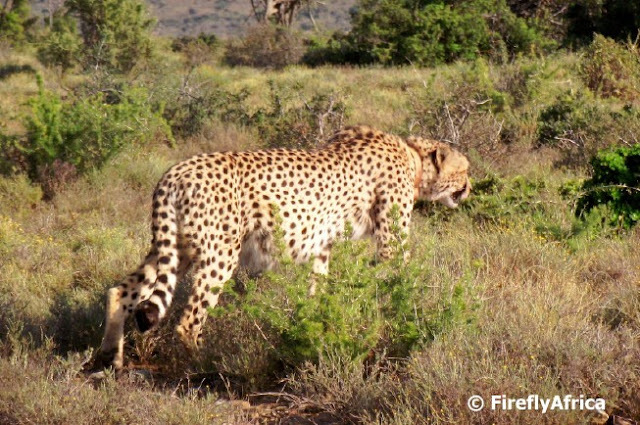 While his feline cousins, the lion and the leopard, are part of the Big 5, the cheetah always seem to be a bit of a Cinderella animal. 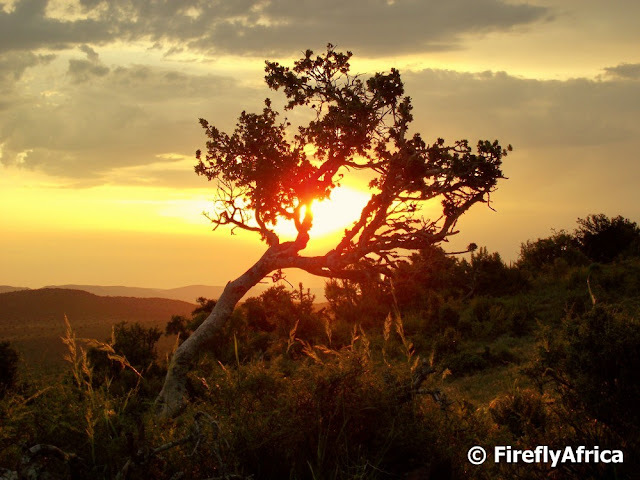 People tend no forget them with the Big 5 always being top of mind, but encountering them in a game reserves is like Cinderella arriving at the ball. The cheetah is a beautiful animal with his spots and sleek physique and if you are lucky enough to see it make a kill, the Big 5 is suddenly forgotten. This was one of two that we saw on a visit to Kuzuko Lodge about 2 hours outside Port Elizabeth. We recently visited Kuzuko Lodge in the northern section of the Addo Elephant National Park about two hours outside Port Elizabeth for our anniversary. 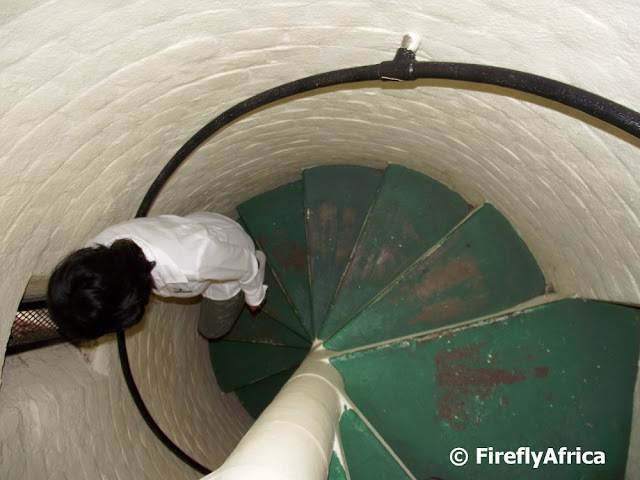 I've been posting about the visit in The Firefly Photo Files if you would like to have a peek. On the afternoon game drive we encountered the lions and afterwards headed up to a lookout spot to enjoy a couple of drinks while watching another African sunset. Sunsets in Africa just never seem to disappoint. 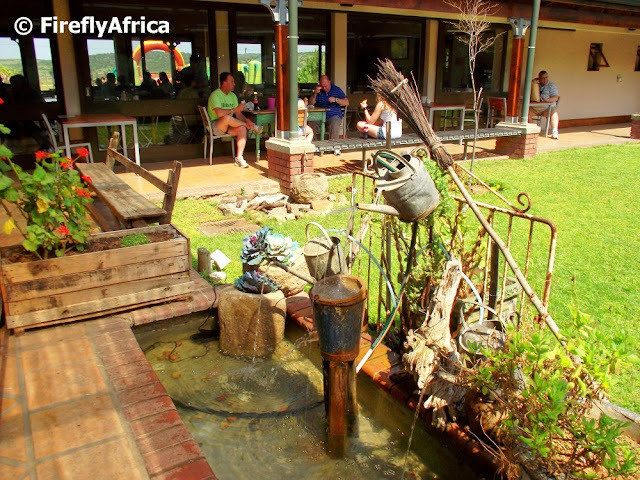 The inside of the Nanaga farm stall outside Port Elizabeth has a big grass courtyard with the shop to the one side and the restaurant to the other. Although there are some people who prefer to sit down and be served a meal, most people just buy a pie or roosterkoek and something to drink from the shop. In the background a couple of travellers are enjoying their Nanaga homemade pies in the relaxed environment of the courtyard. A road trip east of Port Elizabeth, doesn't matter if you are coming or going, isn't complete without a stop at the Nanaga Farm Stall. 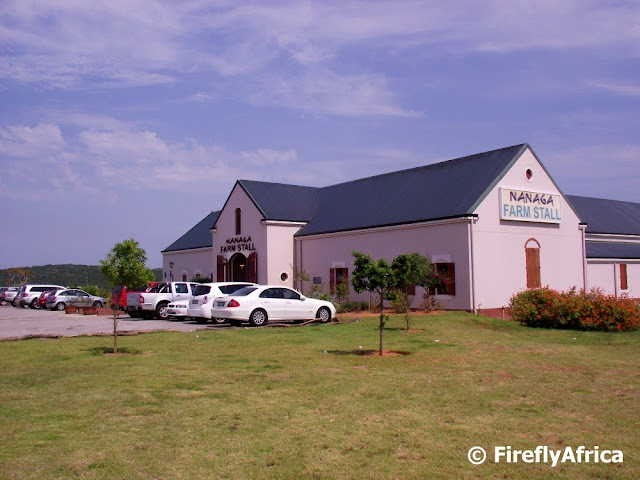 Although its only 50 kilometers outside of town, Nanaga is a must stop for something to eat and drink. 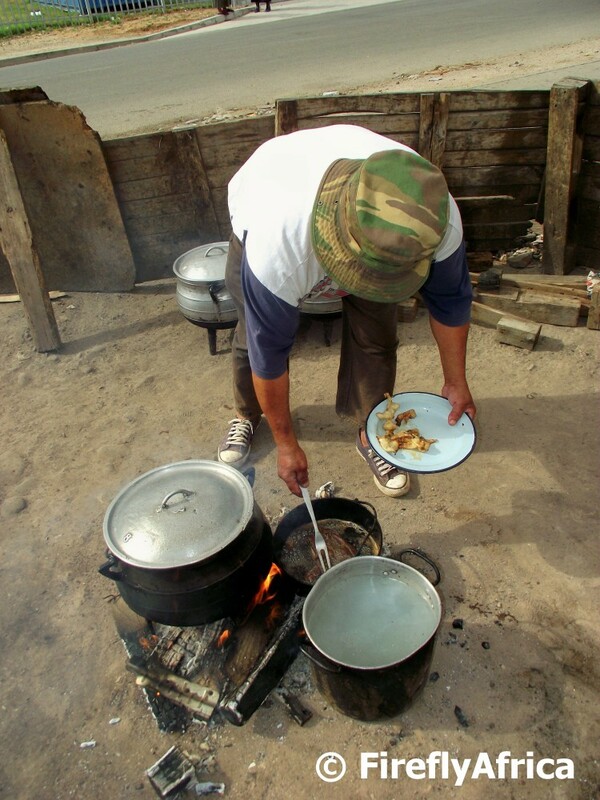 Their speciality is their home made pies and roosterkoek while their pineapple juice is my personal favorite. 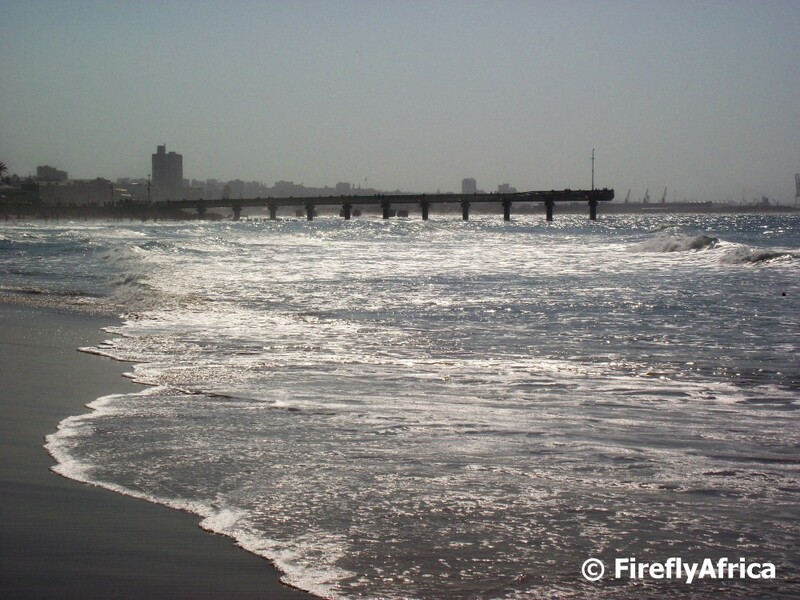 What makes the location ideal is that it's on the main road into town coming from both the interior as well as the country's east coast. 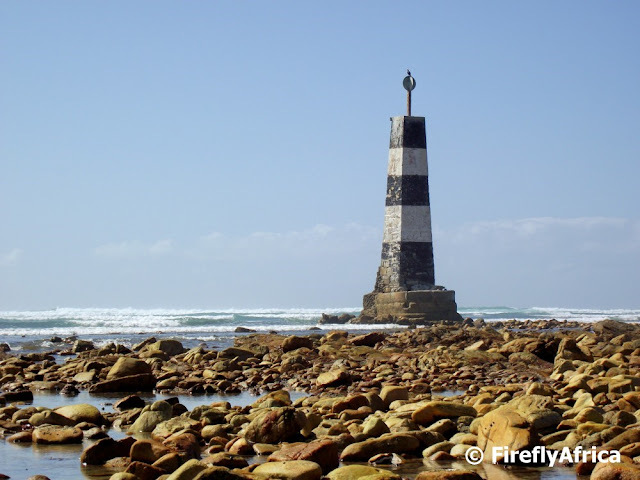 In addition to the lighthouse out at Cape Recife, there is also this "lighthouse looking" tower standing on the rocks. It doesn't have a light though, but it is still a shipping beacon. 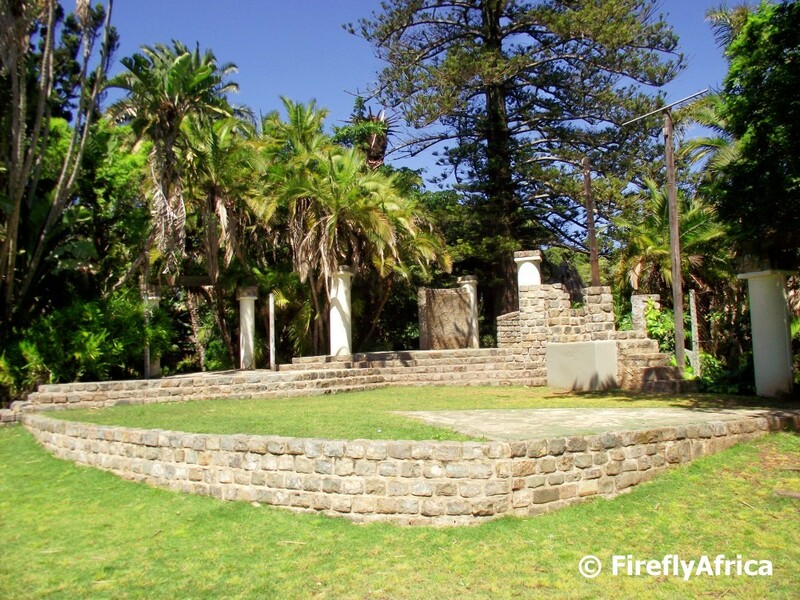 This specific beacon is one of two that had to be lined up in the old days by ships coming from the west before they could turn north and into Algoa Bay. 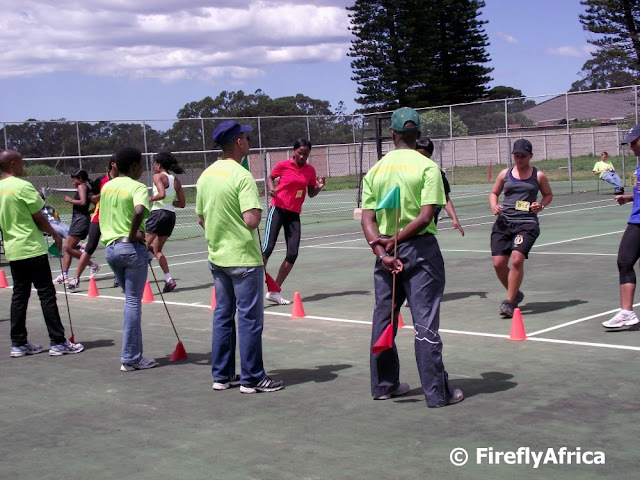 Over the last week the fittest and fastest of South Africa's air force, navy and army soldiers came together in Port Elizabeth to participate in the annual Fittest Soldier competition. I went down to the army base in Forest Hill one morning an watched them do what they call the "Beep Test". The exercise looks quite straight forward with the participants running up and down a tennis court and having to get to the turning line before the beep sounds. The catch is that the longer into the race the faster the beeps go and soon participants start to fall out. 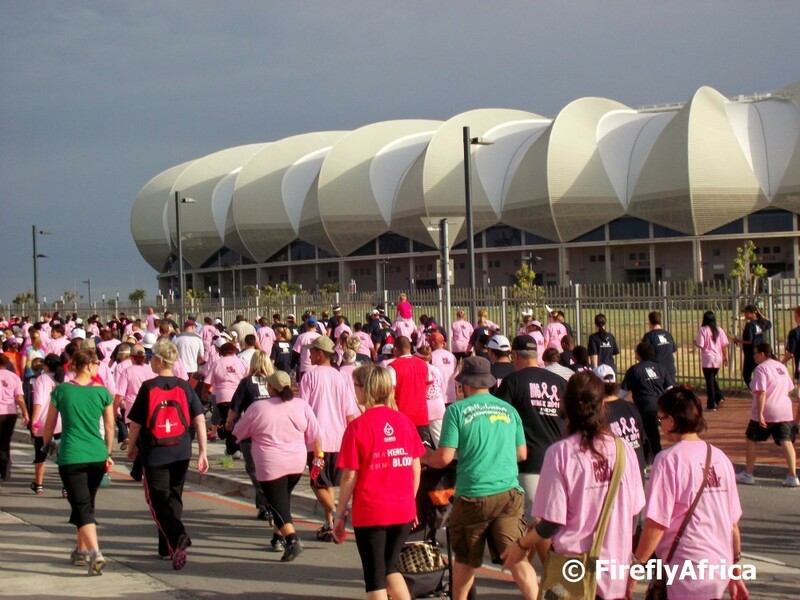 We headed down to the Nelson Mandela Bay Stadium this morning for the annual Discovery Health Algoa FM Big Walk for Cancer along with about 7000 other people. It may not sound like fun having to get up between 5 and 6am to leave home just after 6 for a 7am start, but the weather was stunning and fun walks like this is a great way to escape the house and get some exercise along with the family. 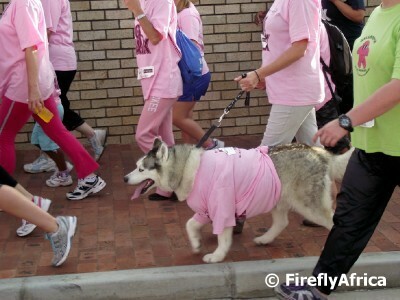 It wasn't just us two legged homo sapience that took part in the race, but also a couple of our 4 legged friends. This one was even wearing a race shirt with a race number on his back. 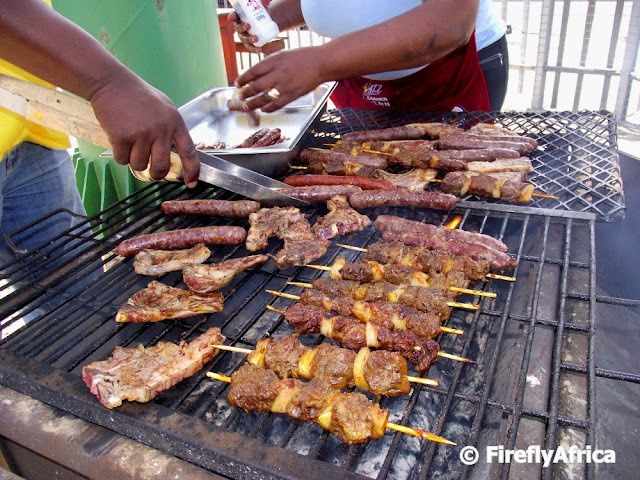 This guy is busy cooking on the street corner in New Brighton township for the coming lunch time rush. There is a very stupid joke that popped into my mind when I saw this picture. Please don't hold it against me. So here goes. A donkey walks into a pub and sits down at the bar. The bar tender asks, "Why the long face?" This long face belongs to one of the donkeys at the East Cape Horse Care Unit. What does Much Ado About Nothing, The Taming of the Shrew, Romeo and Juliet, A Mid Summer Night's Dream, Macbeth, Hamlet, King Lear, Othello and Antony and Cleopatra have in common? Dumb question unless you have never hear of William Shakespeare. The other thing they have in common is that all (or most of them as I can't find a list on the internet) have been staged on this particular stage at the Mannville Open Air Theatre in St Georges Park. The theatre was established in 1972 by Bruce and Helen Mann and every year the Port Elizabeth Shakespearean Festival stages an open-air production of one of the Shakespeare works. One of the departments in the Nelson Mandela Bay Municipality that does wonderful visible work are the guys who tend the gardens along some of the city's roads as well as in some of the parks. St Georges Park is no different and doesn't matter what time of year you go there the gardens are always well looked after. 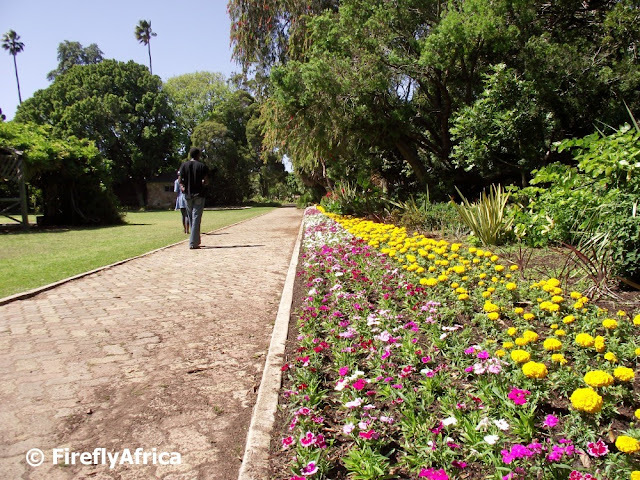 At the moment the flower beds on the hospital side of the park is looking stunning with rows of colourful flowers in full bloom. 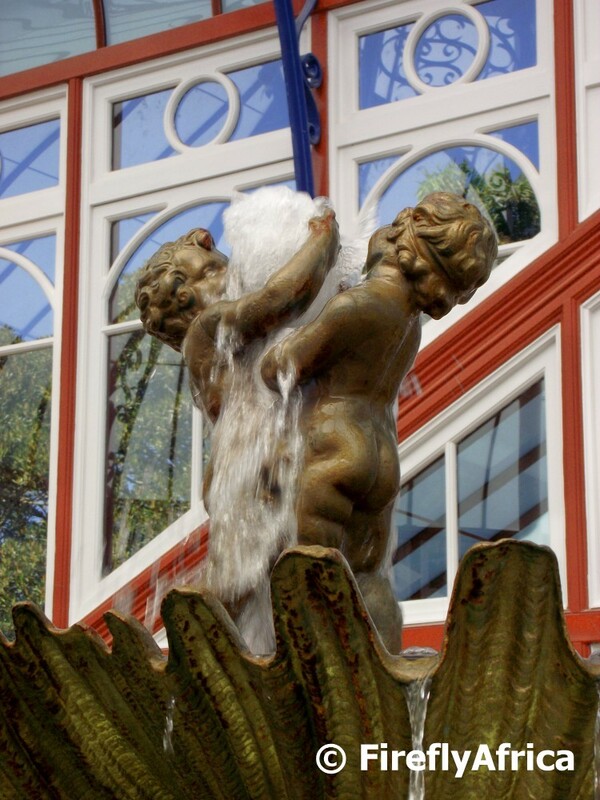 The central fountain in the newly restored Pearson Conservatory in St Georges Park is still the original one that was imported from the United Kingdom in 1882. The interior of the newly refurbished and restored Pearson Conservatory in St Georges Park I posted about yesterday. They have changed the garden setup a little bit from what it used to look like and even though the flowers and plants have only recently been planted it's looking beautiful. And with all the lines and patterns in the building I know of a couple of photographers that would love photographing the building. 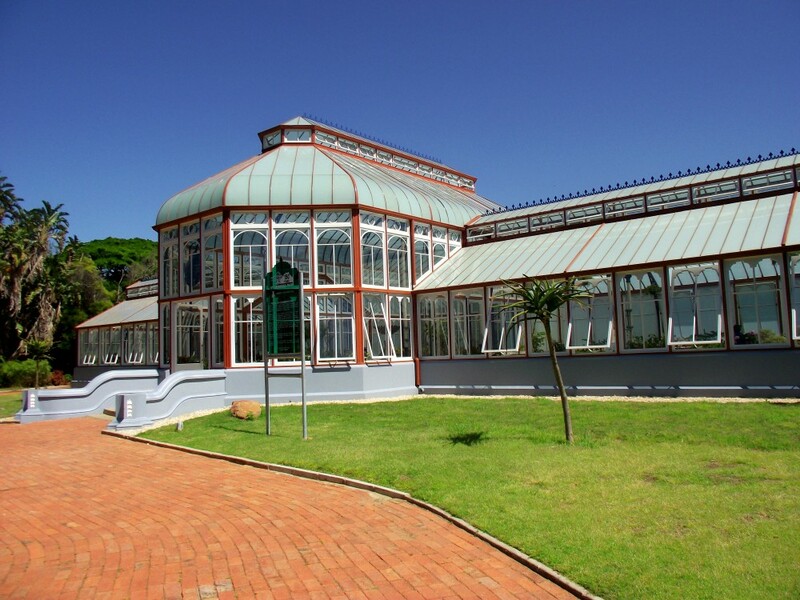 The 150 year old St Georges Park in Port Elizabeth has so many different attractions, but one of its most historic and showcase attractions must be the Pearson Conservatory. This Victorian Conservatory was completed and opened on 12 September 1882 at a cost of £3,800 and was named after Mr HW Pearson, the Mayor of Port Elizabeth at that time. Over the years the building had been fixed up several times and at one stage during the 1970's the city even considered demolishing it. Luckily the municipality then decided not to do it. 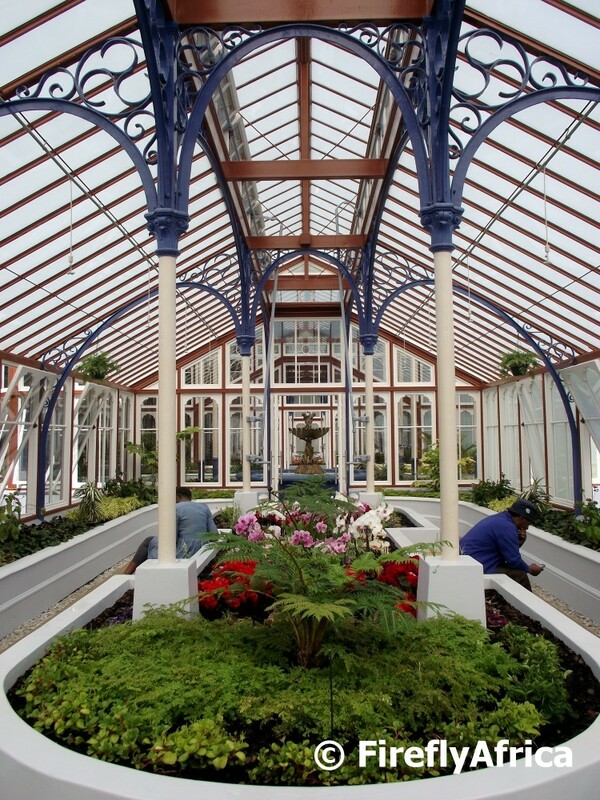 A couple of years ago the decision was made to give the Conservatory a major upgrade and refurbishment and after extensive work was reopened again in September. The place is looking stunning and walking through it the other day all the memories of exploring the place as a kid came rushing back. Its really something the city's citizens can be very proud of and is well worth a visit along with the other attractions around St George's Park. 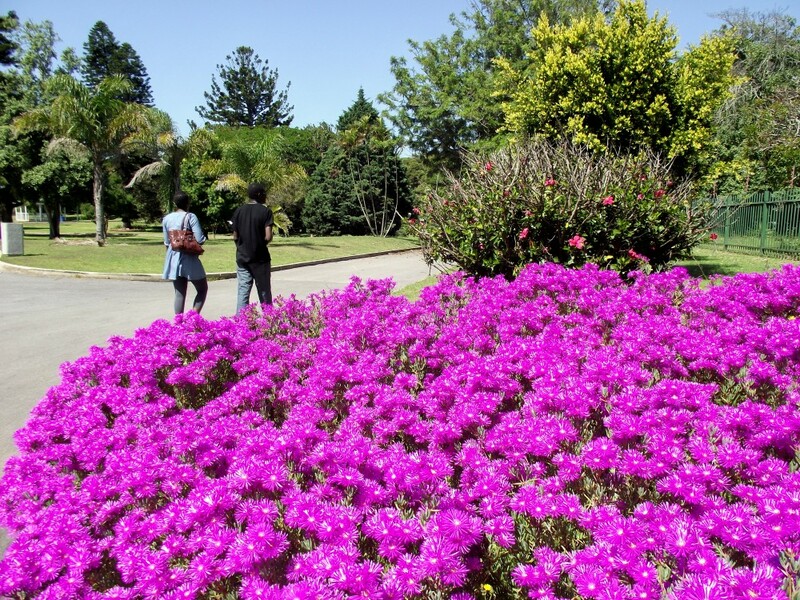 The Fygies, a type of flowering succulent, is in full bloom at the moment, both around the city as well as in the adjacent interior. (Saying it like that makes me sound like a weatherman) This specific bush totally covered in flowers caught my attention in St Georges Park. The fishermen on the rocks in the background are kitted out in windbreakers, have to check their bait every now and then, carefully keep an eye on their rods and seem very uncomfortable on the rocks with a good chance of not catching anything. The fishermen in the front are kitted out in feathers, have beaks to catch their fish with, looks very comfortable there where they are grooming on the rocks and probably all caught a fish this morning. 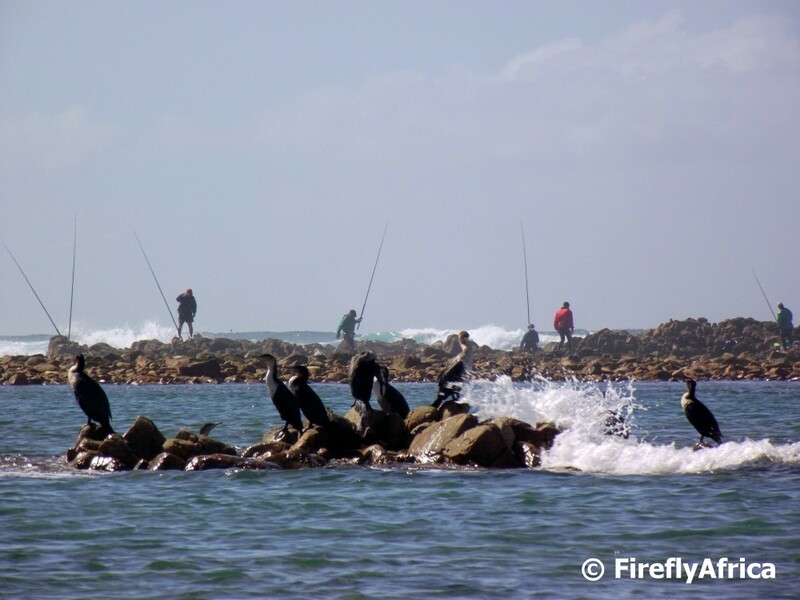 The fishermen in front are cormorants sitting on the rocks at Cape Recife. 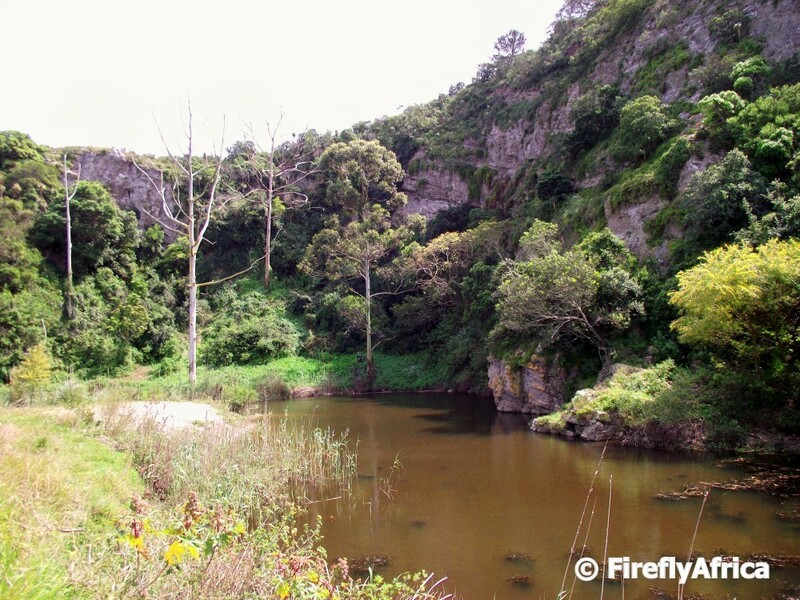 As the Baakens River slowly flows down towards the Bay it passes through Dodd's Farm in Walmer where it widens into a pool with some cliffs behind and lots of vegetation around it. 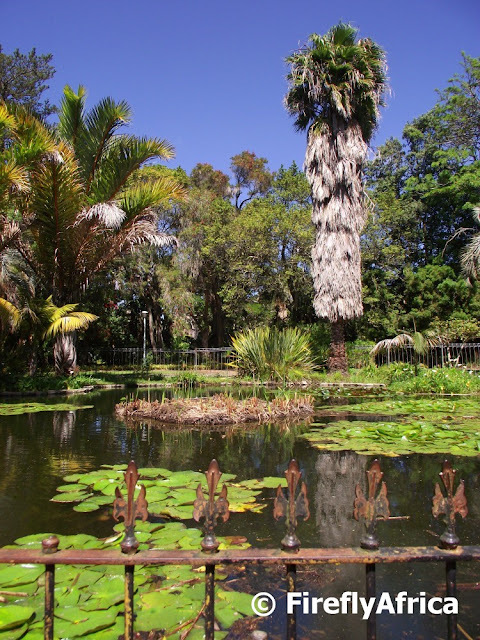 A beautiful spot which could easily have been in a wilderness area somewhere but in reality right in the heart of Port Elizabeth. This is also roughly the halfway mark of the Lower Guinea Fowl Trail. 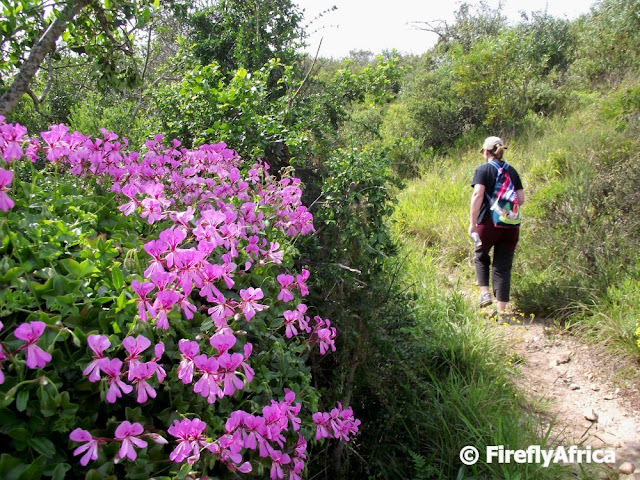 A wall of pink flowers on the Lower Guinea Fowl Trail along the Baakens Valley, just some of the many different types of flowers we saw on the trail the other day. When we were small we spent many Sundays splashing in the natural "tidal pool" behind the big rock at Pollok Beach and passing there the other day it seems that not much has changed. We may have grown up, but another generation of kids now swim there. I've never been very sure where the name Pollok Beach (often mistakenly spelled Pollock Beach) comes from. 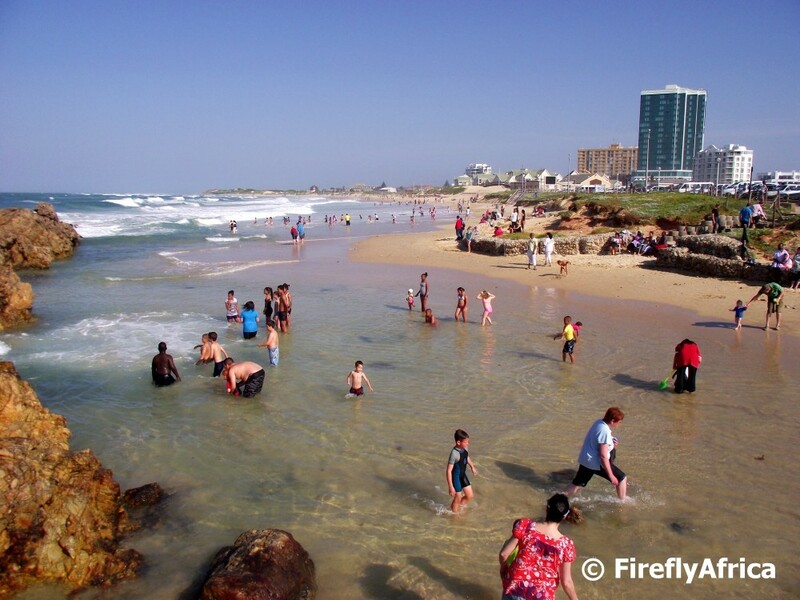 I found the explanation on the Port Elizabeth surf website Millers Local. Pollok Beach was named after the Pollok Hotel that used to stand where the present Summerseas (the buildings with the greenish roofs in the middle of the picture) is today. The Pollok Hotel later became the old Summerstrand Hotel. The original building dated back to the 1890’s, when the sand dunes were reclaimed and allocated for use of a hotel. The hotel was built by a guy called Pollok who built it came from Scotland and named the hotel after himself. 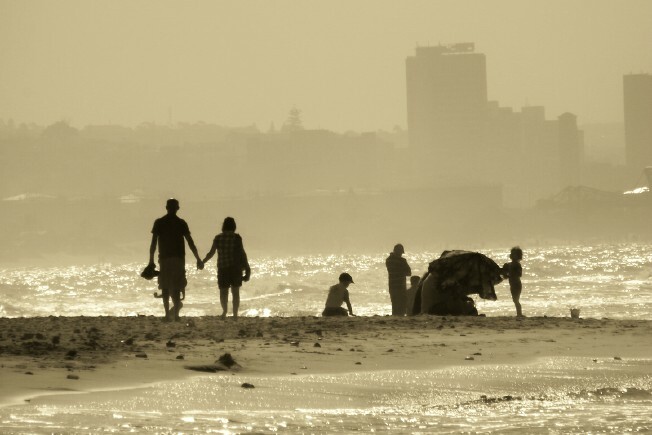 When you are small there isn't much more enjoyable than going to the beach and playing in the sand while growing a bit older the enjoyable beach activity turns into walking hand in hand with the one you love... 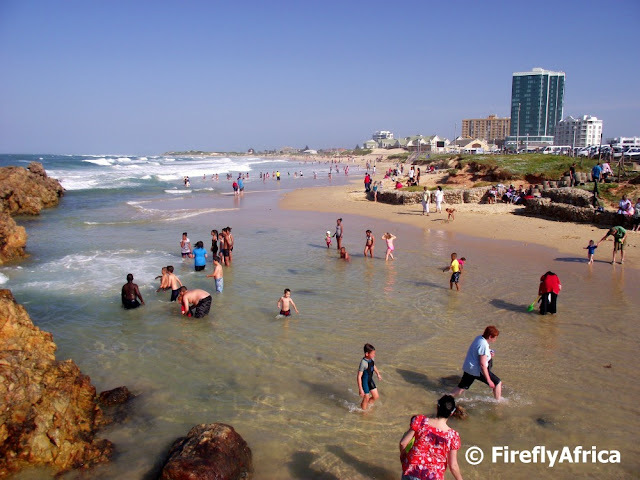 Sorry, that's the best I could come up with to caption this photograph taken on the beach between Hobie Beach and Pollok Beach. Its school holidays and this dad has to keep the kidz busy for a couple of days. I decided to take the kidz to visit the East Cape Horse Care Unit for the first time today. The ECHCU was established in 2006 after it was found that there was a need for the education of horse and donkey owners in the Metro. The unit is based next to the Animal Welfare Society on Victoria Drive and thus do a lot of work in the Walmer Township. 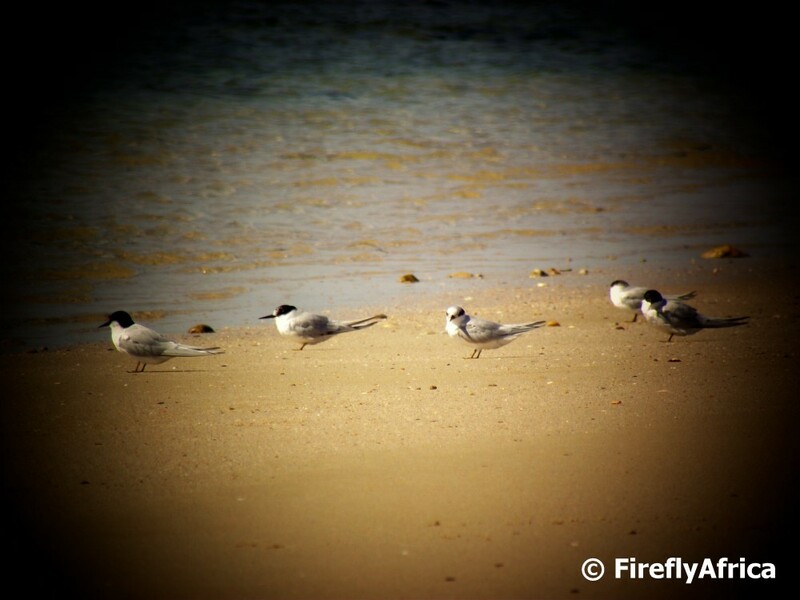 They have recently started to receive a lot of much needed attention thanks to Facebook. This after they started to take care of two orphans needing about 6 - 8 litres of 2% milk a day and appealed to the public to help them out. 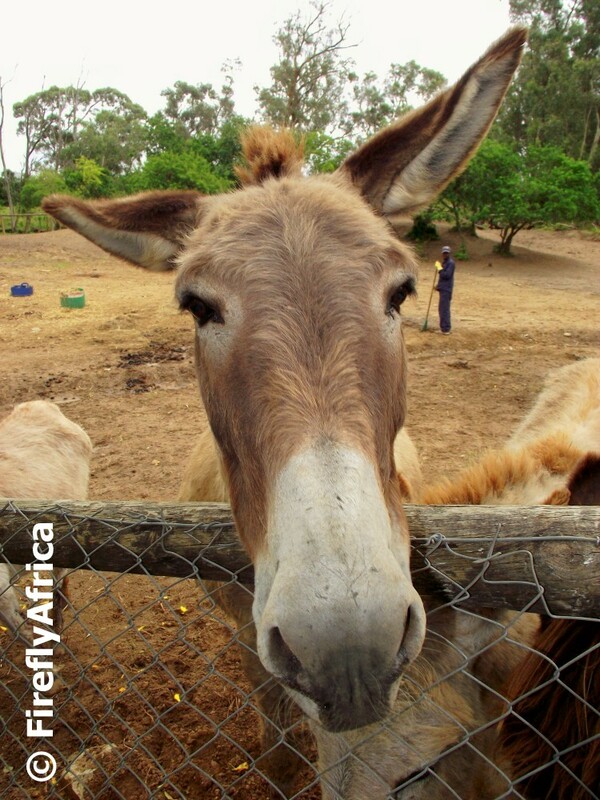 Most visitors arrive with a bag of carrots in hand and the donkeys are just too willing to be spoiled. 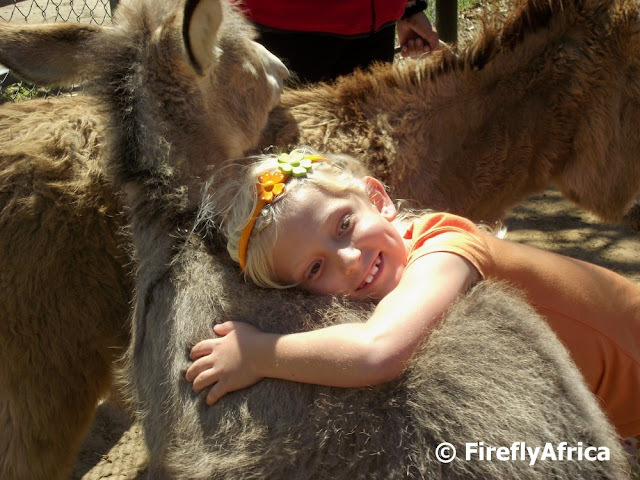 Although Chaos Boy wasn't too bothered with the donkeys, Drama Princess just fell in love with them and I'm sure we will be back very soon (and often), if she had any choice in the matter. A bunch of us walked the lower Guinea Fowl Trail from the 3rd Avenue Dip down to Settlers Park the other day. 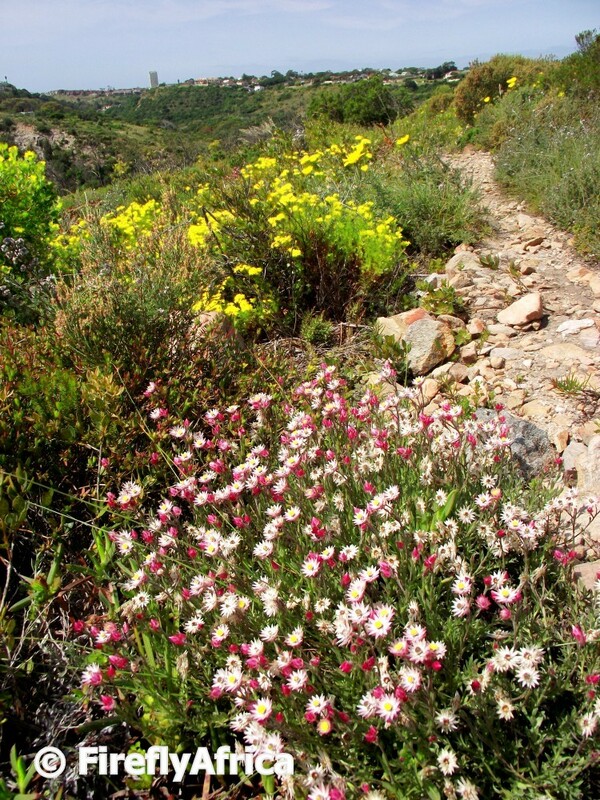 I was absolutely amazed at the amount of wild flowers in bloom along the trail. Although I have been on sections of the trail before and have done the mountain bike trail years ago, this was the first time that I had the opportunity to do the whole trail and I was quite impressed. Its a pity that so many people are afraid to go on the trail due to a couple of incidents a few years ago as I'm sure that it could be very popular once people really discover what it has to offer. So if you don't want to do it alone, why not get a couple of friends together and discover this amazing gem in the city's green lung. One of the best parts about visiting Addo Elephant National Park is that you can drive around the park in the own car and get the opportunity to get nice and close to wild elephants doing so. 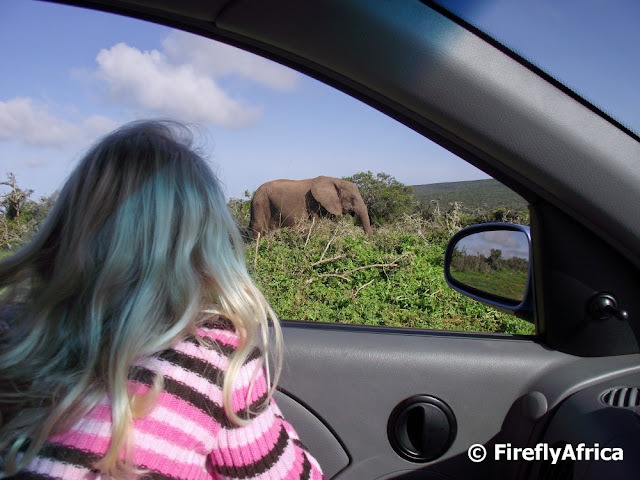 Most private game reserves don't allow small children on their game drives, but Addo gives kids the opportunity to view big game like elephants from fairly close by. 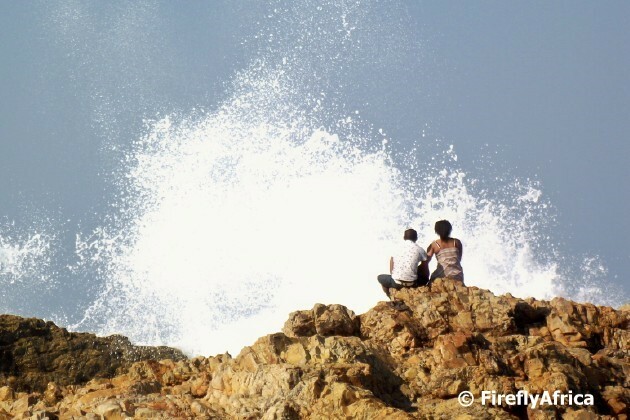 This couple was sitting on the big rock next to Pollok Beach watching the waves. The sea was a bit on the rough side and there was a couple of big splashes. My prosumer camera is a bit slower than a SLR which means that I had taken quite a few duds, but luck was on my side. Seconds after this splash they got up and left.